Posted in Accreditation, News, under Europe. Tagged with exam fraud, QAA, UK. 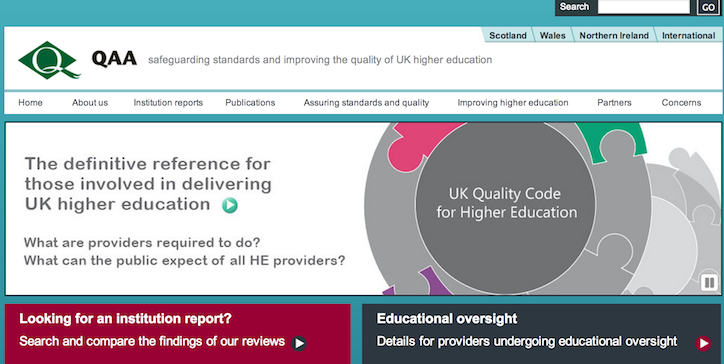 In the wake of the huge UK exam fallout from last week that resulted in the suspension of licences at 57 private colleges and three universities, Director of Quality Assurance at the Quality Assurance Agency (QAA), Stephen Jackson, has said the UK’s current regulatory landscape is not robust enough to prevent against the level of fraud detected. Currently in the UK, there are few barriers to entry into the private provider sector; a major problem according to Jackson. “Anyone can set up a college.. and through that, get access to funding sources like student loan support,” he related. And without the authority of statutory powers, he sees QAA’s role falling short when it comes to monitoring the private sector. Immigration Minister James Brokenshire confirmed last week that an investigation by UK Visas and Immigration and the National Crime Agency found that “much of the worst abuse” of fraudulent English testing and breach of immigration rules took place at London sub-campuses. The QAA has been asked to carried out inquiries into the management of London campuses, the number of students involved, programmes they’re offering and how they’re ensuring the programmes are properly validated. The probe will look at 14 universities with London campuses, including Glyndwr, one of the universities to have its highly trusted sponsor (HTS) status revoked last week. 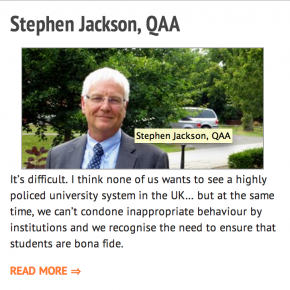 But he added that the QAA are not “Home Office police”. “We don’t have that obligation or mindset about monitoring the responsibilities of institutions and it’s never been a problem with the publicly-funded institutions,” he added. Expanding the organisation’s authority, however, could result in pushback from the higher education sector as a whole. “I think our established institutions would not want us to have statutory powers, because our whole approach of peer review is based on this understanding between the Agency and institutions as autonomous bodies to manage their own quality and standards,” he said. Since the revocation of licences last week, a number of colleges have publicly declared that they will contest the suspensions. The college is in the process of mounting formal charges against the Home Office’s decision. “We intend to provide robust, verifiable answers to all its accusations,” Alderman said. I am glad that Stephen has spoken out as he is correct to highlight the reliance on ‘peer review’ , which to a cynic is close to cronyism. However I am concerned that the article might be read as ‘private sector bad, public sector good’ . I think that the changes in funding make many ‘public sector’ organisations drive harder for short-term profits at the expense of quality. I think that many private sector organisations are honourable and achieve more per student year than many Uni’s. The WHOLE system needs a shake up.